Bitcoin might not be considered a currency in some circles and, right now, government agencies are starting to look at it as more of a speculative asset. Although BTC is highly divisible, it has yet to take off as a method of microtransactional payments – a fact not helped by bitcoin’s potential to skyrocket in price due to hoarding by speculators. Dogecoin, however, has emerged as a favorite microtransaction method on reddit. In fact, most people get their first dogecoin via tipping on the community-oriented site. And that’s all because of Dogetipbot. Fifty DOGE is worth around two US cents. That may not be much, but it’s the denomination that is enticing. A comparable bitcoin valuation for the same two cents is 0.00004512 BTC, which is a bit hard to wrap your brain around and just looks messy. So what would people rather receive, 0.00004512 in BTC or a 50 DOGE tip? And the process is simple. A message in a user’s reddit inbox gives someone the option to accept or decline a tip. A million of anything usually sounds like a large number. In the world of doge, that’s about 1 BTC, however. Mohland says, though, that when there are fundraising efforts or charity drives, the amount can jump drastically. 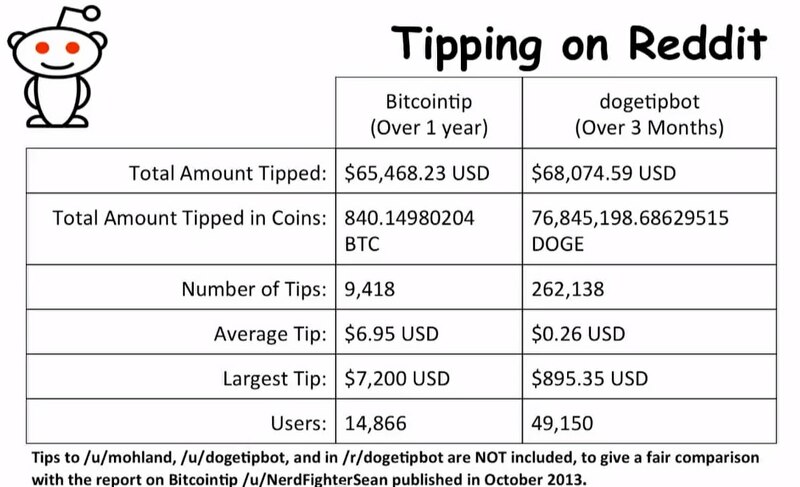 Mohland adds that Dogetipbot is approaching a total of 150m DOGE tipped via reddit so far. 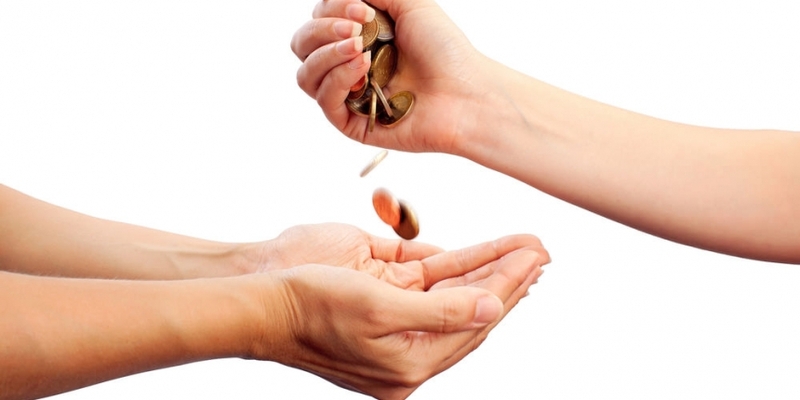 After tipping, donations are one of the biggest drivers of dogecoin’s transactional nature. Some of the best known examples of this include raising money for Indian Olympic athletes, the Kenyan water crisis and an accidental circumstance that led to a NASCAR driver getting 20m DOGE in race sponsorship. In the latter instance, Alex Green – founder of Moolah, a cryptocurrency payments platform – typed in a 20m DOGE donation, instead of the two million he meant to send for Joe Wise’s No. 98 Chevrolet sponsorship campaign. The term ‘shibes’ is a dogecoin community term for people active within their sphere, and references the Shiba Inu dog type that is the coin’s mascot. Mohland says that reddit is just the beginning for Dogetipbot. Tipping and donation campaigns have been significant in helping the reddit community increase the general acceptance of cryptocurrencies. Dogetipbot 2.0, the newest version of the software, has its own internal ledger that calculates account deposits and withdrawals. So when people send or receive a tip, it’s off the block chain. Only when coin is moved to an external wallet is the dogecoin block chain used. The message that reddit users get when they receive a DOGE tip. Dogetipbot 1.0 was simply a fork of a tipping client called altcointip, but that software was unable to handle the sheer mass of transactions through the tip bot. This is the reason why Dogetipbot keeps an internal ledger of account deposits and withdrawals – to reduce strain on the system. “We were using the dogecoin daemon for the longest time with version 1, but on the new version we have an internal ledger,” said Mohland. Mohland was initially a litecoin miner. When he heard about dogecoin, though, he pointed his scrypt rig in its direction and his wallet was soon bulging with DOGE. “I thought [dogecoin] was hilarious, so I decided to point my miners at a dogecoin pool and got about three million dogecoins,” he said. 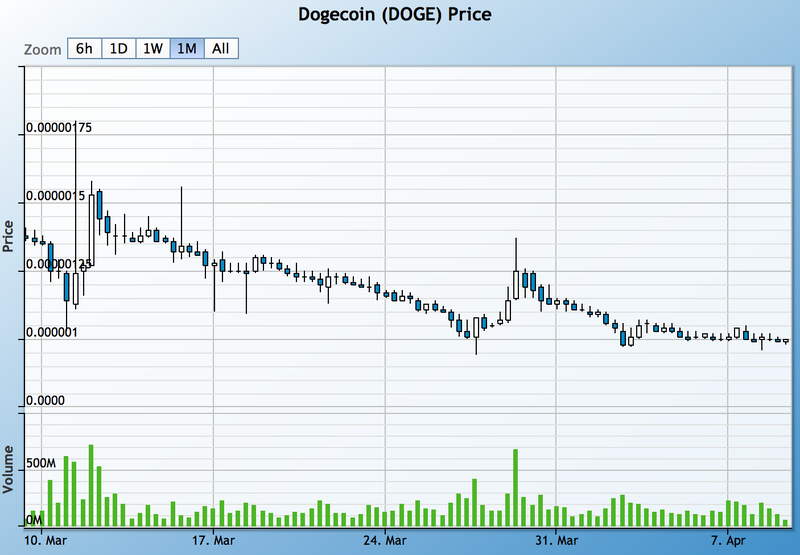 It was the viral aspect that got dogecoin itself to where it is today, something that many startups pine for. Mohland said that Dogetipbot just happened – there wasn’t a whole lot of planning, and people in the dogecoin subreddit were asking for it. So he forked the altcointip client and then posted what he had done on reddit back in December 2013.